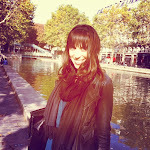 LaFleur de Paris: Shake What Yo Matcha Gave Ya ! Shake What Yo Matcha Gave Ya ! Matcha tea is 10x stronger than “regular” green tea, it’s packed with antioxidants, beta carotene, l-theanine (an amino acid known to reduce stress and anxiety and heighten mental clarity), catechins (for beautiful skin) and, yes, caffeine, but not caffeine that causes a jittery-shaky sensation à la coffee. In fact, Matcha has actually been known to improve insulin sensitivity and glucose tolerance. Matcha also contains fiber and vitamins and minerals and boosts metabolism so it can work both for those looking to lose weight or for those with no appetites hoping to put on some pounds. So, ready to dance the Matcha-rena? Just make sure your Matcha is of the highest quality. Yes, like any luxury item, this means it may be a bit more expensive than your average green tea, but remember, you’re paying for quality, not quantity. Plus, a little bit goes a long way with Matcha so that big bag or container you just bought will last for a long time. Just ½ - 1 teaspoon per serving is all you need to reap Matcha’s benefits. Matcha is perfect as a hot winter tea, whisked in traditional Japanese fashion. Or, you can give it a modern twist by adding it to your favorite smoothies, juices or desserts. Unlike most brewed teas, Matcha contains the whole leaf. Here is my new favorite morning green smoothie recipe using Got Matcha’s amazing Matcha powder for the perfect energy kick to start the day whether you’re entering a sumo wrestling competition, taking the kids to school or heading off to work. Mix all ingredients together in a blender (preferably a Vitamix) until creamy. If you like your smoothies a bit less thick, just add more liquid. 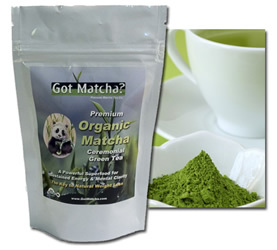 Got Matcha also makes several Matcha powder blends sweetened only with Stevia and coconut nectar including Matcha caramel-apple, Matcha Chai, Matcha Mint, Matcha Pumpkin Spice and Matcha Cacao. I haven’t tried all of the flavors yet, but as for the ones I have, so far, so delicious! (Special mention to the Matcha Chai – literally it’s to chai for. And the caramel apple really does taste like a caramel apple!) It’s great that they use natural sweeteners and don’t drown the delicious taste of Matcha and spices with horrors like agave nectar like many other “organic” companies. They even sell a bamboo whisk set for a more traditional Matcha tea experience. Here’s a great recipe for a cold winter day for an untraditional, yet delicious, take on Matcha as the ancient Japanese warriors consumed it. Matcha Smoothie on ice - it's snow delicious! Mix all ingredients together in a blender (Vitamix!) until frothy, then add to a saucepan and warm slowly over low heat. Drink, by the fire, with your favorite old Japanese man. You can also add some Matcha powder to a green juice for an extra kick! Juice all vegetables then add the Matcha powder and whisk together.